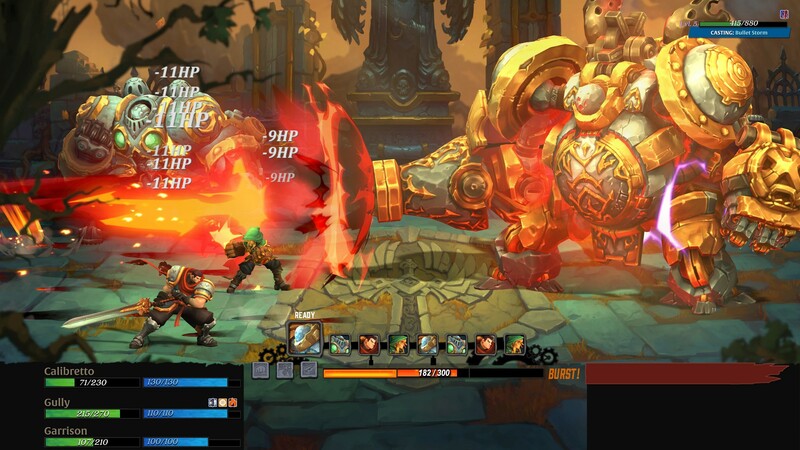 There are a few things you should know about Battle Chasers: Nightwar. The first is that it’s being developed by Airship Syndicate, headed up by industry veterans Joe Madureira and Ryan Stefanelli, two of the founders of Vigil Games, the studio behind Darksiders. The second is that it’s an unusual blend of a dungeon crawler, with the visual aesthetics certain gameplay elements of a JRPG. It certainly shines thanks to this. The choice of visual design actually makes a great deal of sense when you learn that the game is based on a series of comics. The comics, authored by Joe Madureira himself, were released from 1998 onwards. It’s possibly a little ironic, considering the fate of Madureira’s Darksiders, that this series also went unfinished. The tenth and final issue never did get published, leaving the ending on a cliffhanger. Battle Chasers: Nightwar takes on the same Steampunk fantasy theme as the comics and this seemingly runs throughout the game in a beautifully colorful, and ultimately cohesive, style. Not only that, but the game also lends certain designs from JRPG’s and, as easter eggs to fans, Darksiders, with such as characters, weapons and enemies. The way Battle Chasers works is through exploring largely randomly generated dungeons, full of puzzles, traps and enemies. Working their way through these dungeons will be three of six playable characters, each with varied skills and abilities that can be used to complement each other and aid your progression even on the dungeon map, rather than in battle. This is key as any dungeon you explore leaves you with a limited amount of healing possibilities, making resource and character management key. Where you make a large choice is in choosing the difficulty of a dungeon to explore. There are multiple levels of difficulty and the higher you go, the more opportunities you have of receiving rarer crafting materials and other items, as well as the traditional gains in experience and skills. Though one previously unmentioned benefit of exploring multiple types and levels of dungeons is the amount of lore you can find, with tombstones, scrolls and more being spread throughout the game to let you understand what has happened to the world and the town of Harm’s Way. As an example of abilities working outside of battle. Garrison, the fallen Paladin, has a dash ability that can be used to evade traps. Other abilities he has include the ability to blind enemies and evade a possible encounter. This works particularly well thanks to the game’s design choice that is reminiscent of the game Grandia. Monsters are visible, wandering throughout the dungeon, until you make contact with them which takes you into the battle screen. What wasn’t made clear during the event is if pre-emptive strikes can be made by sneaking up on enemies. Moving into a battle places you in a battle that will be familiar to anybody who has played a JRPG in the past. Featuring what seems to be a similar system to the CTB found in Final Fantasy X or Grandia III. What these battles also feature are a meter that lead to battle bursts, powerful special attacks that require different quantities of the level. In addition, there is an overcharge mechanic. The use of normal attacks, rather than magic or special attacks, conserves your mana levels and allows it to regenerate to an extent – working in conjunction with the limitations on healing per dungeon. This overcharge also offers a certain level of protection to characters that have enough of it. Each dungeon is said to last between 20 to 40 minutes. Between each dungeon you are based in the town of Harm’s Way. You will use the resources gained from the dungeons to upgrade Harm’s Way, advancing the levels of your arsenal, armorer and others to use for crafting more advanced weapons and armor. Though it’s in the dungeons that you will find the ability to craft the best gear. Certain rare crafting stations will appear that let you craft the biggest and best in the game, provided you have everything required. The full gamescom presentation can be found on YouTube below, recorded and posted by PCGames.de. The impression I got of Battle Chasers: Nightwar from the presentation at Gamescom is an ultimately positive one. Not only the outstanding aesthetic design, but borrowing some of the best aspects of JRPG’s like the Grandia series, as well as a compelling exploration and crafting system should make Battle Chasers a very interesting game. It’s certainly one to look out for if you’re a fan of dungeon crawlers or JRPGs, coming next year for the PC, PS4 and Xbox One.